A remake of the good-old Warlords game by SSG. This is a huge XL map. All wizards are playable. The scenario requires the mod "Wizards&Heroes3". 16 years have passed since the War of Warlords. Lord Bane has defeated all other warlords. Unfortunately he was not able to rule the empire and was quickly overthrown. 16 years have passed since that times. Another generations have grown up. It's time to unite Illuria under somebody's rule. For Glory! Let the war begin! This huge XL conquest scenario features 8 different warlords battling for the control of a mythical land Illuria. The scenario can either be played partly by the computer or by up to eight different people taking turns in a multiplayer game. Choose not to customize wizards to play at easy difficulty. Choose to customize wizards to play at normal difficulty. Updated May 12, 2007 - The updated package contains two maps for Empire building type of game and for Battle&Magic type of game. The new Battle&Magic scenario features fixed city sizes and building outposts is not allowed. 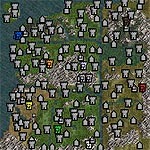 The scenario requires unofficial patch 1.4. and the mod "Wizards&Heroes3". I am big fun of warlords. Can you please make version for general mod like mp? PS: I want Lord Bane!!! This was a fantastic recreation of the old Warlords map, and a VERY difficult game. Thank you for the time involved, it is beautiful. I have tinkered with it to make it a little easier to win. Also it is very difficult which is good, but I think it has one flaw (or maybe its the wizard&heroes mod). The computer uses A LOT of area spells, which makes it very difficult to survive just a few turns in their domain. Its hard to do anything about the fact that your heroes are getting slaughtered by spells if they stay to long in an enemy domain. Maybe I'm missing something, I'll appreciate all good advices on how to prevent it :). I've also wondered if the combatspells do more damage in this mod (cosmic spray, magic fist etc), because my heroes are often killed in the first round of combat with 2 cosmic sprays (1 from the wizard and 1 from a hero). Inspite of these issues I think the map is absolutely excellent, and is simply a must for all old warlords fans !!! Agreed with the area map spells-3-4 times per turn I am bombarded by Ice Storms, while I in turn can retaliate with Sacred Woods and a few other things. Result is the map is now a stalemate. One other comment, which may have to do with the mod and not the map: how in heck do you get level 4 troops? I only have a few buildings left to construct in my capital, and still no option for Titans, while my enemy the Orcs are running around with tons of Gluttons. I played the Battle and Magic map, after the updates. I found it a fun map to play! Seemed good to me. I only played one side the Archons. I know it was a copy of an existing map design, but it was well done. Even thought everyone had the large attack spells the map is large enough that it really doesn't dominate the play (at least against the human). There is always the Forcefield for you key cities. My God, during my own time-consuming map-making project, I totally missed out this one!! BUT: Even though I made my own resources for my latest map - I'm totally unexperienced with mods and stuff and I will be honest - I am much afraid to install your Heroes&Wizzards Mod V3 just to play this szenario. There is a lot to read in the description of the mod and the 100 posts and I am unsure to install it as I understand it to change the whole gameplay and you cannot switch back to origin, is that right???? Hi all! Thank you all for your comments and specially - rat peddler. I also was once a great fan of the Warlords 1 game and the map was primarily made for those who still keep the old game in their hearts. morgul666, Wizards&Heroes mod doesn't replace anything of the original resources. It is easy to install, easy to use and easy to uninstall. You should have no problems with it. Just install and choose it from the list in the Setup program. PS In Warlords1 my favourites were Horse Lords. Though for better challenge I used to play as Sirians. Any chance, that you could make a copy of the map without "Wizards&Heroes3"?